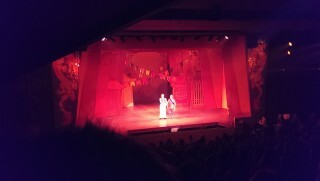 PC Wishee Washee (played by Dale Superville) in Aladdin in the Mercury Theatre pantomime. It’s been a long time since I went to the pantomime so I was pleased when it was suggested we needed to record this year’s production at the Mercury Theatre, Aladdin. Due to (understandable) restrictions in where I could stand I positioned myself right at the top of the auditorium, stage right, with most of the audience between myself and the stage. It was obviously the right decision as I escaped the gaze and the uncomfortable advances of Widow Twankee as she walked amongst the audience looking for a potential suitor. I recorded the first hour of the show and selected this excerpt as there is a great interaction between PC Wishee Washee (played by Dale Superville) and the kids in the audience. Much to my surprise I enjoyed the show and had to try not to laugh at all of the tackiness and innuendo.